The Pocket Dogs and the Lost Kitten is a sequel to Margaret Wild’s story The Pocket Dogs. Biff and Buff are tiny dogs. So tiny they fit in the pockets of Mr Pockets’ coat when he goes out. They’re his “pocket dogs”. One night a lost kitten appears on the doorstep, wet and bedraggled. Mr Pockets takes the kitten in and cleans it up. Biff and Buff adore the kitten and share their cushion and toys with it, until they become jealous of the time Mr Pockets is spending with the kitten. Doesn’t he want to play with Biff and Buff anymore? Biff and Buff soon find their imaginings getting the better of them, dreaming they are left out in the cold and fed food they don’t like. They become territorial and don’t let the kitten, or Mr Pockets, near their cushion or toys any more. Fortunately it doesn’t take long for Mr Pockets to realise what’s going on, and he reassures Biff and Buff they will always be special to him. Meanwhile, the kitten, feeling upset that the pocket dogs didn’t want him around, has left in search of a new home. Biff and Buff and the kitten become fast friends, and they all seal their new friendship, and new family, by giving the kitten a name. Stephen Michael King’s illustrations add lots to the story for readers to enjoy. Mr Pockets has a unique style, and the pocket dogs and kitten have quite individual personalities, all borne out in their visual depiction. 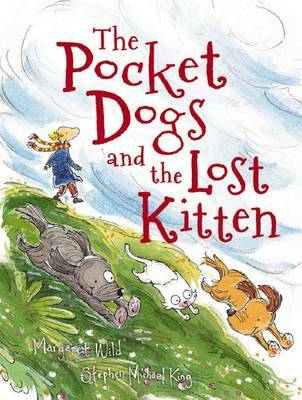 The Pocket Dogs and the Lost Kitten is a gentle story for young readers, and help for introducing or strengthening their understanding of friendship and sharing belongings and relationships. I'm so excited that Biff and Buff are back. The Pocket Dogs is a lovely book and I can't wait to read its sequel.